· Our account has been frozen, Joel needs to submit the names and student numbers soon. The concrete/rebar footing. The engineer said 12" under the lock block wall, and 4 in between. The wall strength; We need to make sure it can withstand an explosion, therefore we need to work out the calculations for the pressure and verify it with Dr Rogak. We also need a door for sound suppression and a series of vents to vent the gases. · Not sure if the parts that we ordered during the summer have arrived yet. · We should make an inventory of the parts that we have. · James will finish the injector plate drawing. · Winnie will assemble all the SolidWorks drawings and make them ready for machining, however she needs to add tolerances to the parts, which is difficult. Parts will expand thermally at different rates, so we need to make sure that they still fit. Need to consult Dr Pete Ostafichuck, the Mech 2 coordinator. · Curtis will look into machining companies. · Dr Meech wants to try for the Lunar X-Prize, so we will collaborate with T-Bird Robotics. Curtis, Kirsty and I met up and we moved most of the UBCRP stuffs from Rusty Hut to the Thunderbird space in ICICS. - Regular weekly meetings will be held every Friday at 5PM in the CHBE space. 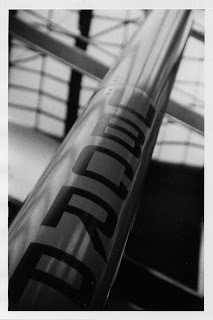 - A google group is set up at http://groups.google.com/group/ubcrp-avionics. Meeting minutes, updates and files will be posted there. It's not a public group so either signup at the site or contact Aaron. Welcome back to all returning members, Welcome all new members! - Over the summer more research was done regarding sensors and data storage. - Data storage will most likely consist of flash memory, Aaron has hooked up a flash card to his computer and can read and write to it. - Next step is to determine exactly what needs to get done to provide a more realistic time line. - Before we can program the microcontroller we need to know how many sensors we are going to use, as well as their values. Since it will take a long time to program, this should be done as quickly as possible. - Nose cone design is done and is currently being reviewed by a third party. - Once we have a P. Eng sign off on our building design the test facility can be built. - Still need to find a machine shop to machine the engine components. - PAF from last year has been spent, follow up to ensure that it was received properly. - We no longer have any team space, so we need to find some new space on campus. Approach ECE, MECH, FIZZ for space. - High Powered Rocketry Certification will be going ahead for those interested. Cost of ~$600 to gain certification, may be able to get it subsidized in part by PAF or MECH department. - Recruiting for the team happened on Imagine Day. We will also be present at the Student Design Team Information Session (Tuesday Sept 18, 6-8pm) and will have a movie night afterwards. Location TBA. Further recruiting at Club Days; will discuss this more next meeting. Team photos taken on Aug 11, 2007. Enjoy! 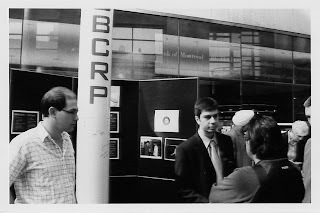 With only a month of summer remaining before the UBC rocket project blasts off into the 2007 fall semester - and since news is pretty slow right now - I thought I'd post some old school pictures of the UBCRP team. 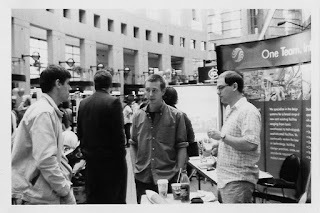 These photos were taken at the Central Vancouver Public Library in May 2005 during engineering awareness event. I'd just like to express our team's best wishes to the families of those killed and hurt in the accident at Scaled Composites' test facility earlier this week. Scaled has been a huge inspiration to us and to many others around the world. It would be no exaggeration to say that a lot of our team members idolize the people at Scaled, including those who were caught in the blast. While there are not many details available at this time, it is known that the accident occured during a test of the propulsion system. This was a sobering event for us, as it reinforced the fact that what we are doing can be dangerous and requires the utmost care. We are currently in the building permit phase of our propulsion test site development. A lot of effort is being put into eliminating the risks that can be eliminated, in into mitigating the risks that cannot be eliminated. Oversight on this process is being provided by university professors, lab health & safety officials, building officials, and fire prevention officials. There will always be risk, and we will always have to be careful. Kirsty brought us awesome pens that look like 1930's-style rockets! They have a fuel tank filled with gel (no slosh baffles), and an led in the engine area. Courtesy of her Dad and AT&T. 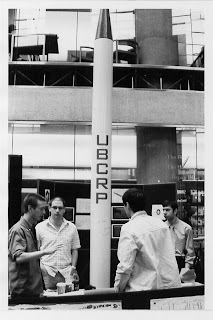 The UBC Rocket Project Blog is maintained by several members of the team from various engineering disciplines. To search this blog by keyword, use the "SEARCH BLOG" function at the top left-hand corner of the page.